The first myeloma session today starts off with the highly anticipated results of the use of Ninlaro as a maintenance therapy following stem cell transplantation for newly diagnosed myeloma patients. Currently, Revlimid is the only approved agent used as maintenance therapy for patients. Dr. Meletios Dimopoulos of Athens, Greece and his team was interested to see if a proteasome inhibitor—like Ninlaro (also known as ixazomib, the only oral proteasome inhibitor) —could be a suitable alternative to Revlimid as some patients are unable to tolerate Revlimid for an extended time. Other proteasome inhibitors, like Velcade, have been used in this capacity previously, but never in a trial that compared it against a placebo. Dr. Dimopoulos’s trial consisted of 656 patients divided into two groups: (1) those receiving Ninlaro as maintenance therapy (395 patients), and (2) those receiving no maintenance therapy (261 patients) following their transplant (ABSTRACT 301 https://ash.confex.com/ash/2018/webprogram/Paper112079.html). These results suggest that Ninlaro may represent a new treatment option for maintenance therapy for patients after stem cell transplant! Another exciting development and potential new drug on the horizon for myeloma patients is the drug venetoclax, an oral drug that is FDA-approved for CML, a type of leukemia. 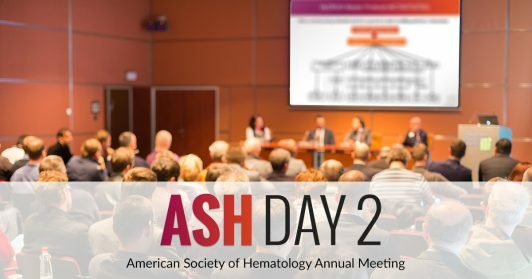 In his phase 2 trial, Dr. Luciano Costa from the University of Alabama combined venetoclax with Kyprolis + dexamethasone in patients with relapsed or refractory myeloma (ABSTRACT 303 https://ash.confex.com/ash/2018/webprogram/Paper117026.html). Dr. Costa and his team reported on the safety and effectiveness of this combination in 42 patients. He showed that 79% of patients achieved a response. When he looked at the patients who were refractory to previous treatments like proteasome inhibitors or immunomodulatory drugs or both—he reported that still over 70% of these patients responded to the combination therapy. Strikingly, 100% of patients who harbor the chromosomal translocation t(11;14) responded with 63% being complete responders! Effectiveness was still high even in those patients without t(11;4)—74% responded with 32% being complete responders. Venetoclax is being studied in one of the arms of the MMRF MyDrug trial, specifically for t(11;14) patients. The final presentation this morning focused on a comparison of treatment options for older and “intermediate-fit” myeloma patients. Fitness refers to a frailty score that combines age, functional status, and comorbidities—factors that contribute to older patients’ outcomes to treatment. The score defines older patients as fit, intermediate-fit, or frail. In this presentation, Dr. Alessandra Larocca from the European Myeloma Network in Italy compared the use of the following 2 treatment strategies in intermediate-fit older patients: (1) 98 patients received Revlimid + dexamethasone followed by Revlimid maintenance therapy, and (2) 101 patients received Revlimid + dexamethasone continuously until disease progression (ABSTRACT 305 https://ash.confex.com/ash/2018/webprogram/Paper111796.html). Dr. Larocca showed that both groups had comparable efficacy but the group that received Revlimid maintenance could tolerate the treatment better and that it was more feasible to administer than continuous Revlimid treatment.